That was what I was thinking as I filed out the doors with the rest of the soft-spoken, slightly startled audience. 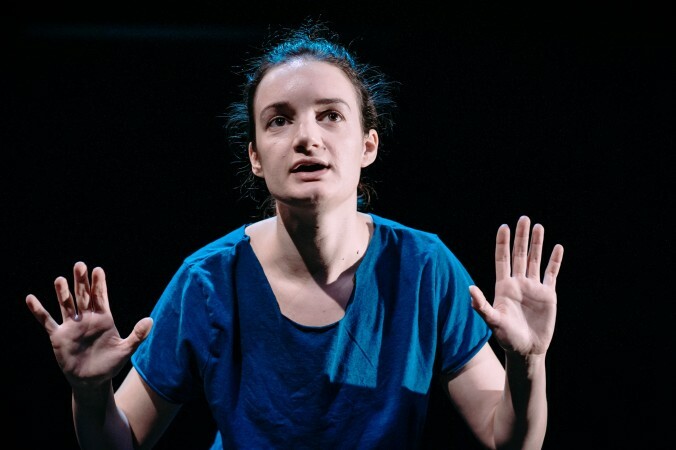 Aoife Duffin’s one-hour, twenty-minute solo performance of A Girl is a Half-formed Thing is a remarkable display of loss, rebellion and desperation – a kaleidoscope of the darker aspects of the human experience – worn by Duffin like her very own skin. I thought of her final bow, her tear-stained cheeks glistened under the lights and I felt moved by her authentic, heart-wrenching performance. The story, adapted by Annie Ryan from Eimear McBride’s award-winning novel of the same name, has begun touring the UK and made quite an impression on sold out audiences from the 2014 Dublin Theatre Festival to the 2015 Edinburgh Fringe Festival, and currently right here in Bristol at the Tobacco Factory. 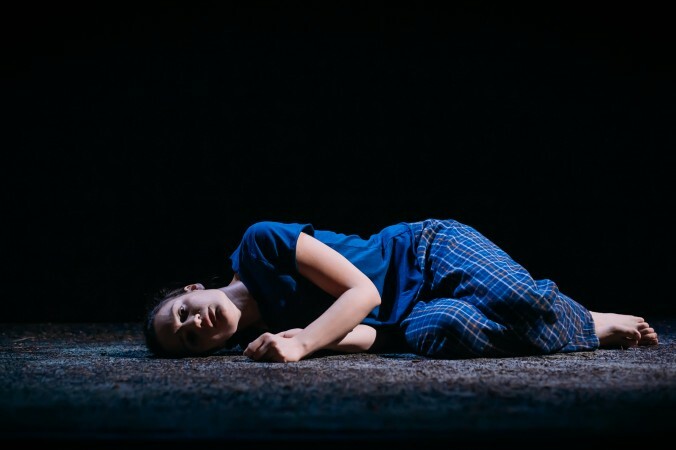 Standing on a blackened stage with only a few white stage lights and very subtle sound effects, Duffin tells a story of a girl’s life, starting in the womb. The girl, who’s name we never learn, is born into a single- parent, Irish-Catholic home with an older brother who’s been fighting cancer since the age of four. Her narrative takes us through her and her brother’s upbringing, allowing us to meet a number of characters along the way; from their emotionally abusive mother to the doctors treating the cancer, the “snooty” aunt and the pervert uncle. Glimpses, soundbites and snapshots of this girl’s life at different ages are what we are privy to and Duffin successfully manages to portray each age with subtle variations in pitch and stance. Each character is powerfully presented with distinctive accents and pronunciations. It is no surprise Duffin was the winner of the Edinburgh 2015 Stage Acting Award; she portrays each individual with such honesty and care. The truth of this girl’s story is told against a backdrop of Irish flare and religious guilt, but sadly, her story is not uncommon. Regardless of heritage or religious upbringing her story of sexual assault and abuse is echoed in many women’s stories from around the world. This play authentically speaks to how our childhood experiences impact our development as we grow into adulthood, how mental health issues are often all too easily disguised, how poverty limits opportunities, how abuse comes in many forms, and most of all, how sexual abuse leaves lasting marks. I must say that as a woman I felt a real connection to this performance and believe there is power in women working together to tell these kinds of stories. Ultimately, it is the speaking out of these uncomfortable, ugly and cruel accounts that will encourage men and women, both, to strive for better. A heart-felt congratulations to McBride, Ryan and Duffin for creating such a powerful theatre experience. A Girl is a Half-formed Thing is showing at the Tobacco Factory Theatre until 30th January 2016 followed by performances in Salford, Leicester, Cardiff and Liverpool. Tagged a girl is a half formed thing, tobacco factory theatres. Bookmark the permalink.